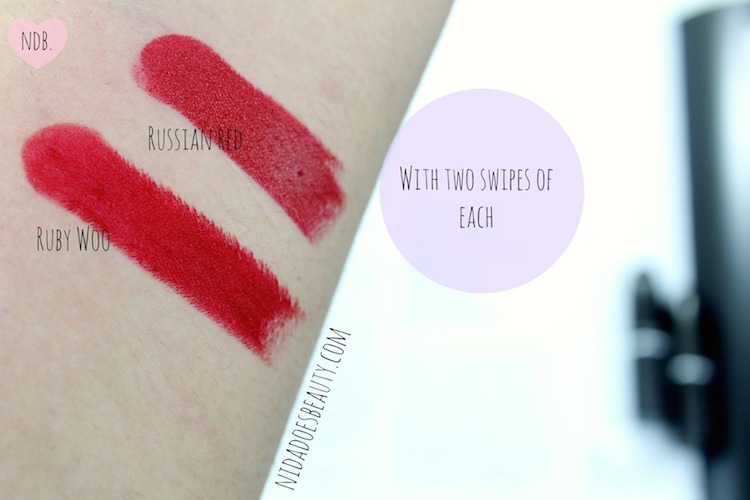 Ruby Woo and Russian Red are well known MAC lipsticks, but which one should you get if you can’t decide between the two hyped up lipsticks? 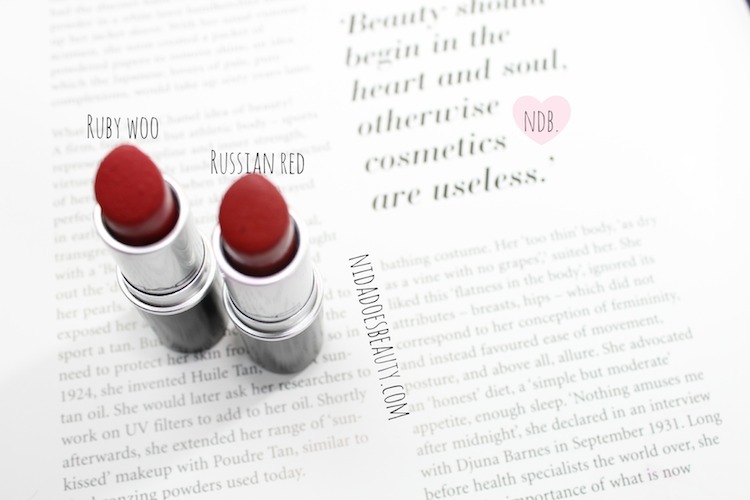 This is MAC’s Ruby Woo vs Russian Red, a comparison between the two. I don’t know anyone who hasn’t heard of/ thinks this color is gorgeous; there’s a reason it is so hyped and has reached ‘cult classic’ status. Ruby Woo looks gorgeous on literally every skin tone whether you are super fair skinned, dark skinned and everything in between. If you’re looking for a matte red color that really stands out and looks like an almost electric/ neon red, this color is for you. However, there is one major downside to this shade that tends to turn people off: the formula. Ruby Woo is a retro matte shade, which is one step drier than matte, so of course you would expect it to be drying on the lips, but this lipstick takes the word dry to a whole new level. Since this is so dry, applying it can be a little difficult; it tugs at the lips and doesn’t glide on smoothly. I find that you really have to weigh the pros and cons of this lipstick. Stunningly gorgeous shade that really amps up any look; even if you just wear this with lots of mascara you will look glam. Dry, “like a piece of toast”– My Big Fat Greek Wedding, anyone? If you suffer from severely chapped lips then I would probably skip Ruby Woo because it settles into the fine lines of your lips so if they are extremely chapped it won’t be a good look. Even if your lips are not naturally chapped, I would go ahead and exfoliate and heavily moisturize before applying this lipstick, let the moisture sink in and then apply this lipstick. Do not, I repeat, do not apply this right on top of your lip balm because the color will not be as vibrant as it usually is. Your lips need to be bare, but not chapped. Does that even make sense? I hope so. Russian Red is a lot creamier in formulation, but it definitely isn’t as vibrant a shade as Ruby Woo. Russian Red is a little bit darker and more neutral. This has a matte finish, but it does not feel uncomfortable on the lips. When applying this lipstick from the bullet, it doesn’t tug on the lips because it has a creamier finish that is almost moisturizing when compared to Ruby Woo. Even though it might not be as electric or neon as Ruby Woo, the color is still very vibrant and opaque even with just one swipe. If formula is very important to you and you despise dry lipsticks then I would definitely stay away from Ruby Woo and purchase Russian Red instead since it’s still a gorgeous red shade. However, if color is more important then I, personally, would purchase Ruby Woo because it is more on the neon side. At first glance, both shades are extremely similar, but if you are a lipstick aficionado then you will definitely notice the subtle differences in color. Regardless of your level of lipstick-expertise, you will definitely notice the differences in formula and applicability, but both red shades are classics in their own right. Even though I have both shades I generally lean more towards Ruby Woo if I want to wear a red lip. Now, if you’re a complete lipstick hoarder like me, you should just go ahead and pick up both shades because they’re both so pretty! Have you tried either of these? Which one do you prefer? Let me know in the comments!